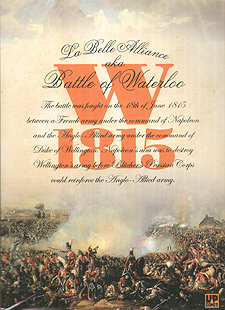 The Battle of Waterloo was fought on the 18th of June 1815 between a French army under the command of Napoleon and the Anglo-Allied army under the command of Wellington. The French aim was to destroy Wellington's army in detail before Blucher's Prussian Corps could reinforce it. As the game begins, Wellington has carefully chosen a strong defensive position thus placing the initiative on Napoleon to attack. W1815 is a simple strategy game that simulates the key events of this famous battle in 15 minutes. The French side can try a number of different strategies in an attempt to crush the Anglo-Allied army before the Prussians arrive. Meanwhile, the Anglo-Allied player must focus on keeping his army in the battle by using reserves in the right situations until the Prussians get into the action.